Resigned but working. The former Presidency Minister supposedly resigned, yet she is pictured on official treat with the President, whose ‘zero tolerance’ to corruption is a government chorus but what does this mean? There was a long-standing argument made by NRM and State House aides and spokesmen that somehow Museveni as a person was honest and meant well, but it was “the people around him” who let him down either by their incompetence or their corruption. Then there was the concurrent explanation that the President, like all other well-meaning Ugandans, was repulsed by corruption and vowed to fight it. The only problem, went the explanation, was that to fight corruption Museveni could not act on the basis of rumour and hearsay. There had to be “evidence”. Of course, many in the public knew much more than the President’s aides imagined and knew better than to believe this absurd line of argument. But still, to avoid the risk of being sued for defamation, the public and the media went along with that official explanation. And so on Thursday, January 12, 2012, the perfect set of circumstances finally presented themselves. That day, the government-owned New Vision newspaper published a front page photograph of Museveni meeting a visiting Chinese government minister. To the left of the photograph, partly hidden but clearly identifiable, was none other than Winfred Kabakumba Matsiko. This Kabakumba Matsiko, it will be recalled, was the Minister in-charge of the Presidency, who had been implicated in the illegal or at least unethical use of equipment belonging to the national broadcaster UBC at King’s FM, a private radio station in Masindi Town that she has an interest in. In a radio on the premises of King’s FM, the Uganda Police had retrieved and confiscated the equipment. Kabakumba Matsiko after some resistance had resigned and her resignation was accepted by the President. Here was all the evidence that anyone, even the most ardently NRM supporter needed. The suspected crime had been investigated by the police using all its professional resources. 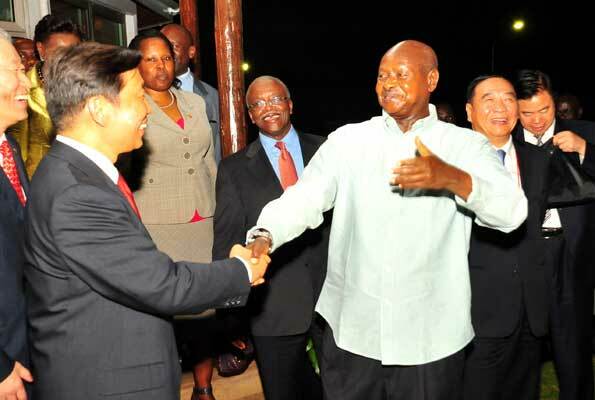 And yet, here was President Museveni, beaming as he talked with the Chinese dignitary, and Masiko very much in his company, in a photograph not taken by the Daily Monitor or any other paper regarded as “anti-government” - whereby an NRM supporter could claim the photo was doctored - but government’s very own newspaper. Many Ugandans know of chits and other hand-written notes from the President directing this or that official to give this or that job or tender or favour to this or that aide, family member or supporter of Museveni. Even Museveni’s spokesmen know that much of the public knows the truth of Museveni’s personal hand in official corruption, but the spin and defending the indefensible has had to go on because in Africa, a head of state is the law. The law is used to mete out political retribution. However, at last after years of pretending we did not know how much Museveni condoned official corruption, we now have a piece of evidence we can present in any court of law or public opinion to make the case that corruption thrives and has been growing in Uganda precisely because Museveni does not mind it that much. The striking sequence of coincidences that led to the New Vision’s publishing of that photograph, unwittingly helping history vindicate Museveni’s critics, offers hope to Uganda. One day, the truth about corruption and other political and military secrets in Uganda since 1986 will come out too, by this kind of strange coincidence. In recent years, there have emerged members of parliament, spokesmen and other functionaries within the NRM who have established a reputation of critiquing their party’s mistakes. Among them are NRM spokesman Ofwono Opondo, MPs David Bahati, Chris Baryomunsi, Theodore Ssekikubo, Wilfred Niwagaba, Muhammad Nsereko, and before he became a minister, Henry Banyenzaki. They gained much public respect for this apparently principled stand against corrupt NRM leaders and speaking out for the wider good of Uganda. Given all this now glaringly obvious evidence that Museveni personally cheers on official corruption, we have to ask questions of these “moderate” voices within the NRM. What are they still doing in the NRM? Practically every day, Nsereko is on one or the other radio station condemning corruption in Uganda, the prohibitively high commercial bank interest rates, the subsidies paid to private electricity providers, the ruined state of Uganda’s government hospitals, the roads and other infrastructure. Why can’t they also resign? Apart from the fact that he is the Member of Parliament for Kampala Central representing the NRM, there is nothing that distinguishes Nsereko from an FDC or DP politician. The same clarity in condemning the decadence in Uganda is heard from Opondo and others within the ranks of the NRM “moderates”. But despite this, they remain within the NRM even when it is clear that there is no hope left that the NRM will ever return to good governance.